The Accounting Career Awareness Program (ACAP®) is an innovative career development program designed specifically for minority students who are entering their junior and senior years in high school. Its primary objective is to increase the number of high school students from underrepresented ethnic groups to attend college and major in accounting. We launched our first Accounting Careers and Awareness Program (ACAP) residency week in July 2012 at the University of Central Florida with a class of 15 upcoming high school juniors and seniors. We have since continued to host this program every year at the University of Central Florida in the month of July. Financial Literacy is a vital part of our chapter programming. 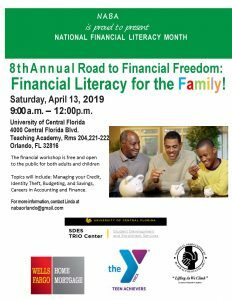 Every April for Financial Literacy Month, the chapter partners with the YMCA Achievers Program, Fifth Third Bank, the Orlando Alumnae Chapter of Delta Sigma Theta Sorority, Inc. to discuss budgeting, savings, credit card, identity theft and more to students and their parents of the YMCA Achievers Program. The Women of NABA Network (WONN) is a professional and personal development program focused on our female members. WONN events and professional development sessions strive to equip women with the tools needed to reach their ultimate goals, while navigating the challenges of being a professional woman in today’s world. Each year at the Annual Convention, NABA host an invitation only, exclusive luncheon for the women participating in the WONN Management Session and WONN Executive session at the convention. This event is developed in partnership with our corporate partners. In addition to sessions and programming included in the Annual Convention, WONN events are hosted by select NABA Chapters around the country. The Greater Orlando Chapter hosted it’s Inaugural WONN event on May 14, 2016 titled “Conversation over Chocolate” at Ferris and Fosters in Baldwin Park. The chapter continues to host WONN events throughout the year where members are able to foster new relationships and be empowered in their personal and professional endeavors. 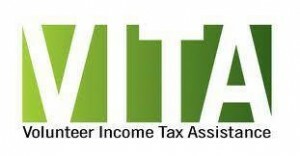 The NABA Greater Orlando Chapter launched our own Volunteer Income Tax Assistance (VITA) site in January 2011 at the James R. Smith Center. Since then, we have provided free tax preparation to over 300 individuals and continue to add to that number each tax season. Thanks to the dedication of our Inaugural VITA Chair and Site Coordinator, Karimah Adderly, and the many volunteers that have participated, we have been able to continue to serve the community in this capacity. Greeter/Screener – You greet everyone visiting the site to create a pleasant atmosphere. You screen taxpayers to determine the type of assistance they need and confirm they have the necessary documents to complete their tax returns. Tax law certification is not required for this position. Tax Preparer – You complete and successfully certify in tax law training, including the use of electronic filing software, to provide free tax return preparation for eligible taxpayers. Quality Reviewer – You review tax returns completed by volunteer tax preparers, ensuring that every taxpayer receives top quality service and that the tax returns are error-free. You must be tax law certified at least at the Intermediate level. Site Administrator/Coordinator – You have excellent organizational and leadership skills. You are the primary resource for sharing your knowledge of the program and are available to assist with any issues that may arise. You develop and maintain schedules for all volunteers to ensure adequate coverage, supplies and equipment at your site. Tax law certification is not always required for this position. We accept professionals and students to help us man this site and give back to our community. Non-NABA members are also encouraged to volunteer. If you are interested in being a greeter, tax preparer, or site coordinator, please email us at [email protected] and be sure to come out to the training session in January.